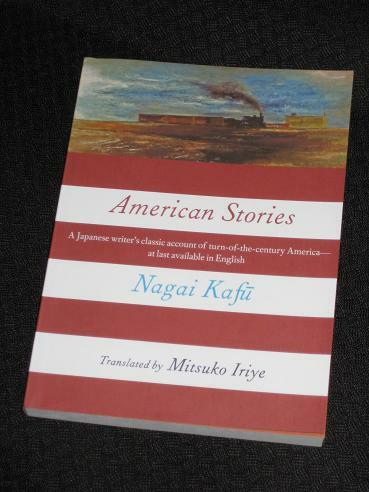 Nagai Kafu’s American Stories (translated, and with an introduction, by Mitsuko Iriye) is a collection of short works written during the author’s time overseas. While Mori Ogai chose to pursue medical studies in Germany (and Natsume Soseki had a horrid two years studying literature in England), Nagai’s coming-of-age trip to the west took him to the United States – and (naturally) he decided to write about his experiences in a country he considered to be the new capital of the world. American Stories is a strange book in many ways though. While at times it reflects Nagai’s own experiences (similar in tone to Heinrich Böll’s Irish Diary or a more literary Bill Bryson), other parts are straight fiction, short stories reflecting the people and places he came across on his travels. What links many of the stories is the way Nagai uses frame narratives and stories within stories, perhaps hiding his own opinions within a Russian-doll structure. Nagai is well-known for his stories of Tokyo night-life, and he often covers the same ground here. Several of his stories revolve around men bewitched by ladies of dubious morals. In ‘Long Hair’, a Japanese student enters into a relationship with a woman whose marriage ended because of her infidelity, abandoning his studies and becoming her plaything. In a sign of what might be to come for that student, a later story, ‘Old Regrets’, has an old professor telling the story of how his marriage ended – after confessing to an embarrassing affair with a low-class actress. The tales of sexual tension and frustration don’t end there. Many of the Japanese men featured in the stories appear to be struggling with balancing respectability and libido in a place far from home (you do start to wonder how much of this is autobiographical…), and we eventually move from extra-marital affairs to the pleasure quarters. There is much talk of the difference between prostitution in Japan and the US, and in ‘Ladies of the Night’, the Japanese reader is ‘treated’ to an insight, in the form of one night in a New York brothel. On the whole though, the stories look at characters with ambiguous feelings towards their mother country and their adopted home. ‘Daybreak’, set on one night on Coney Island, sees a young Japanese man explaining to the narrator why he has run away from his responsibilities and joined, if not the circus, the carnival at least. ‘January First’, set during a New Year’s party of ex-pat Japanese, looks at the role of women in Japanese society, one which the main protagonist compares unfavourably to that of American women. Many thanks for this post, sounds very interesting, a book that I've been curious to read for a while. ← Welcome to Japanese Literature Challenge 7!